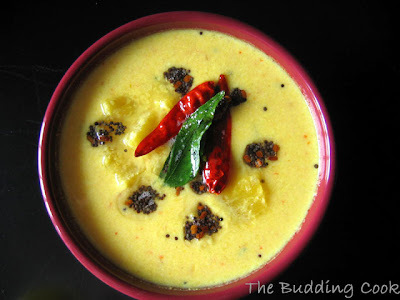 Pulissery is a sweet and sour yogurt based Kerala preparation that is regularly made at home. It has been one of my favorites since childhood. It can be made using a couple of different fruits. My mother makes the best pulissery ever, and she does it usually with ripe mangoes or pineapple. She does make it with plantains too, though I do not care much for that version. Cook the pineapple cubes along with some curry leaves, salt and turmeric powder in a little bit of water on medium heat till the pineapple pieces turn soft. Add the ground paste of coconut, cumin and red chillies to the cooked pineapple and continue cooking for another 3-4 minutes. This is being sent to Jyothsna of Currybazaar who is hosting RCI: Cuisine of Kerala. Thanks TBC. THe picture surely looks nice! Nice entry for RCI.....Pineapple pulisseri is well liked in my home too after mambazha pulisseri. I love this. I can eat them a lot with plain rice and a bit of mango pickle. DELICIOUS. I love pulissery. Its late in the night IST, going to wind up, but i have hunger pangs after seeing this. I have never had pineapple pulisseri. I will surely try this. Thanks for sharing. My mouth is truely watering. amazing recipe, i always have this at my friends who are keralites. Its just heavenly with papad and mango pickle!!! Looks delicious TBC, can imagine how good it must have been! The picture is fabulous! Lovey color to the curry. Have just started making pulissery and will love to try it soon. wow TBC, that looks really pretty! how does it taste though? like is it sweetish?? how do the spices taste with the pineapple and yoghurt? but never made with pineapple!! BTW u r no budding cook !! U R A PRO !!!! I am confused in the names , kootu, pulliseri- dunno which belongs to TN / AP and which to kerala!!! I have a SouthIndian cook book, but no mention of regions!!! I have a can of pineapple, will try this!!! Lovely picture... yummy pulisseri..Love pineapple. Love pulissery an dcan have tons of it! Ripe mango and pineapple ones are my favorites. The picture makes me crave some :). I love this curry too..not the plantain variety! lovely pics...nothing can beat rice, this and thoran.. I tasted once with mango version. Pineapple Pulissery is very new to me and looks very colourful. Thanks for sharing. this is new to me! Lovvvvely curry.What beautiful shots my dear tEc!!! I make ethappazha pulisseri with almost the same base..
A very yummy one, hm? Superb Photo!! 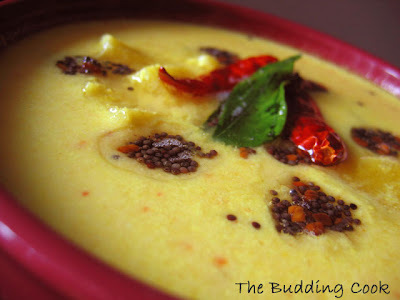 Loved the way u put tadka on top.. Never knew Pineapple was used in Puliserry!! Lots of new dishes to learn. PineApple in Yogurt gravy...that must be quite a combination?! I shud try this. A beautiful combination of flavors! Gosh, I love the internet! Thanks for sharing. I like how beautiful the colours are! If you do try it, give me some feedback, o.k.? I love the mango version too. Seema- thank you so much. Grihini- It is a great combination indeed. If you like sweet tasting dishes, this one's for ya! Thanks for leaving your comment on my blog - 365 Days of Pure Vegetarian - http://365daysveg.wordpress.com for the Edible Chocolate Cups recipe. I appreciate it. Your blog is wonderful and I like the contrast background with the color pics. Great Job. I would like to add you in my links. Picture is lovely. Actually, I prefer the nendrapazham (plantain)and ripe mango versions. If your pineapple isn't sweet, this turns out a bit "pulichchi"! Wow looks lovely and mouthwatering!Nice entry for the event TBC! I love the idea of this with rotis - bookmarked to try. btw, i've tried giada's balsamic truffles recipe too!! TBC, I'm smiling at the way you've symmetrically arranged the tempering all over the gravy - the second shot is really nice. This is very intersting...I love pineapples and they surely taste good everytime...Looks very yummy!! Priya- thanks for stopping by. Aparna- thanks. I think I like the mango version more than this one. Pulissery is supposed to be having some " puli" to it...hence the need for sour yogurt in the preparaton. BTW, where exactly in Kakkanad are u? Lakshmi- I know they will not go well with rotis:-(. It is a curry for rice... but let me know how it turns out. How did u like Giada's truffles? And u like the 2nd pic more...bah!.. just like Rajitha! I love any pineapple-based dishes. This looks so good. Got to try it sometime. Thr r lots of pineapples in delhi these days. Yours look so good that I really want to give it a try. This caught my attention, what a beautiful recipe! I tried this out recently at a new restaurant the other day but it was mango pulissery. Tasted great. This is bookmarked right now for me to try with mango. Mangoes are great too. Unfortunately we don't get really nice and sweet ones here so I use pineapple. Ramki- thanks for stopping by and for letting me know. New cooks will definitely learn a lot after visitng your space.